Review: My Beauty Diary - Southern France Apricot | Memorable Days : Beauty Blog - Korean Beauty, European, American Product Reviews. Haven't done a sheet mask review for a while ^^". The previous my beauty diary review was the peruvian sunflower sheet mask. Today I'm going to review the Southern France Apricot mask. This mask is suitable for normal skin. It is especially recommended for dry skin and combination skin that tends towards dryness. Yes it should be a very suitable mask for me~!! 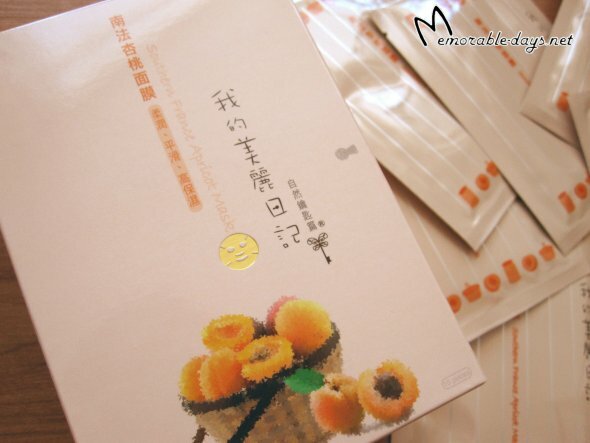 My Beauty Diary Southern France Apricot Mask softens, smooths and highly moisturizes the skin. Apricot extract from southern France provides excellent moisturizing effect. It quenches the thirst of skin, leaving dry skin keenly comfortable. The skin surface will be inscrutably velvety to the touch. Added with extracts of highly moisturizing grain, such as oat, job's tears and hydrolyzed rice protein, it gives more in-depth nourishing and nursing effect to dry skin. The stratum corneum is fully soaked in moisturizing ingredients. It maintains skin’s suppleness, elasticity, fairness and clearness. The packaging is orange and the words at the back are silver. It has a few apricots on the box and on the packaging. It just looks simple & neat :), nothing to complain about. Once I opened the packaging I could directly smell a light & sweet apricot scent ^o^. Whoaa~ it smelled good, it's the scent that I expected! The mask itself is thin and it has heaps of serum on it. 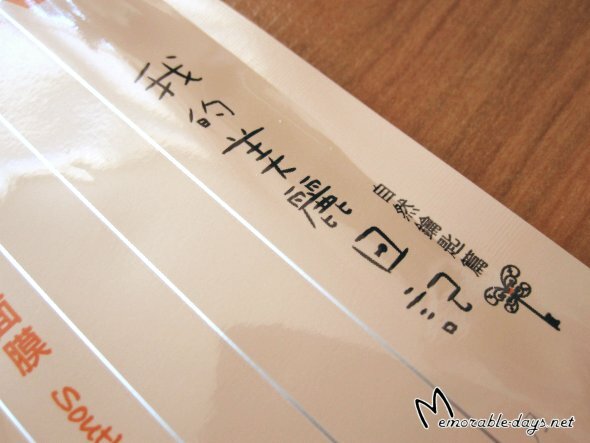 I think it's the my beauty diary mask with the most essence =3! The essence wasn't dripping but there was a lot of serum in the packaging, so I applied the leftovers on my whole neck. This can be positive but also negative. Some people like a lot of essence and some don't. I'm one the people who likes heaps of serum :). People in Holland & Belgium can buy it at my webshop: Peachies. Water, glycerine, butylene glycol, propylene glycol, prunis armeniaca (apricot) fruit extract, avena sativa (oat) kernel extract, coix lacryma-jabi (job's tears)seed, triethanolamine, polysorbate 20, methyl paraben, hyaluronic acid, xanthan gum, sodium pca, citric acid, algae extract, centella asiatica extract, hydrolyzed rice protein, sorbitol, aloe barbadensis gel, gentiana lutea root extract, malva sylvestris (mallow) extract, saccharum officinarum (sugar cane) extract, acer saccharum (sugar maple) extract, citrus anrantium dulcis (orange) fruit extract, citrus medica limonum (lemon) peel extract, styrene acrylates copolymer, dimethylsilanol hyaluonate, carbomer, polyglutamic acid, sodium hydroxide, fragrance. Clean your face and pat it dry. Throw away the plastic sheet. Unfold the sheet mask and put it on your face for 20-30 minutes. When it's time to pull the sheet mask off, you gently massage the excess tonic on your face & neck and wait till everything is absorbed. It probably will feel a bit sticky at the beginning, but just let it absorb. It does do what it says: it moisturizes, softens, smoothens the skin. The fit of the mask was good for my face =). 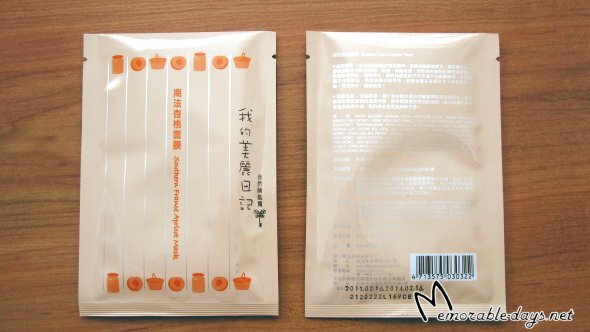 A few things that I really liked about this mask were the nice, sweet apricot scent and the light cooling effect. It felt fresh and cool when I had the mask on. This mask is definitely good for people with a normal to dry, combination dry & dry to dehydrated skin. Sooooo yes, this mask is recommended!